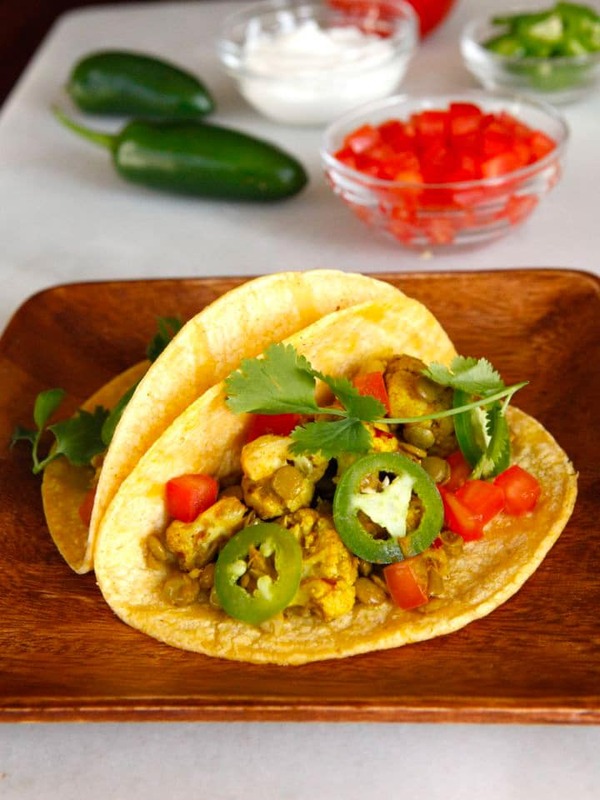 Tacos are a classic part of most Cinco de Mayo celebrations, but most are made with meat. I decided to develop a vegan taco filling as a lighter, meatless option to beef, chicken and fish. Why should meat eaters have all the fun? Believe it or not, I think I like these Vegan Lentil Cauliflower Tacos better than any meat version I’ve tried. 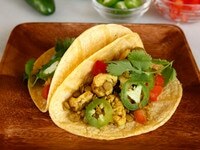 The texture is terrific, and the spice blend gives these tacos savory depth. I really love them! Lentils are a great meat substitute in many dishes. They are popular now, but they haven’t always been. During Classical times wealthy Greeks would not eat lentils, as they were deemed a “poor man’s food.” Hippocrates, recognizing their many health benefits, prescribed lentils to his patients that suffered from liver ailments. We now know that the high amounts of choline found in lentils help to improve liver function by aiding in filtering toxins from out of the bloodstream, proving once again that Hippocrates was ahead of his time. Though lentils have been a food staple in the Middle East and Mediterranean for centuries, they didn’t really catch on in the U.S. until World War II, when they became a popular meat substitute during wartime rationing. 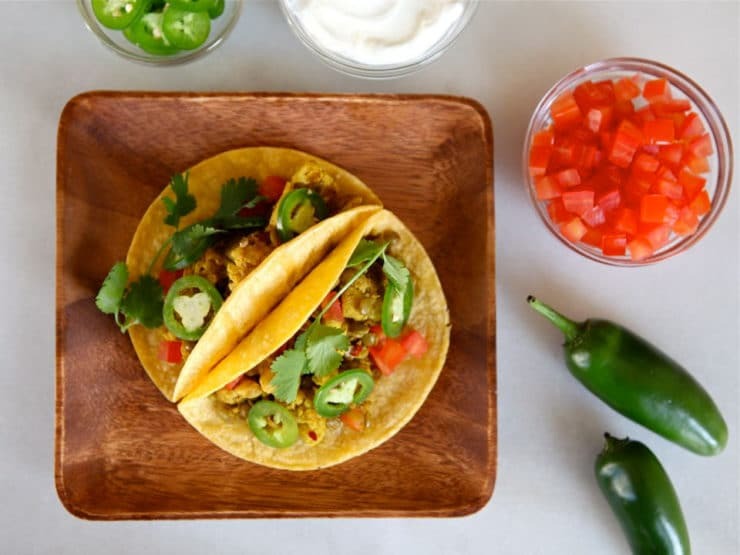 These healthy tacos are lacking meat, but don’t worry, they are loaded with flavor. Combining cumin with turmeric and a hint of cinnamon gives the lentils a truly special essence. The addition of tender, sautéed cauliflower adds a more hearty texture. Top them with sour cream or vegan sour cream for another layer of goodness. These tacos are truly special. I hope you enjoy them as much as I do! 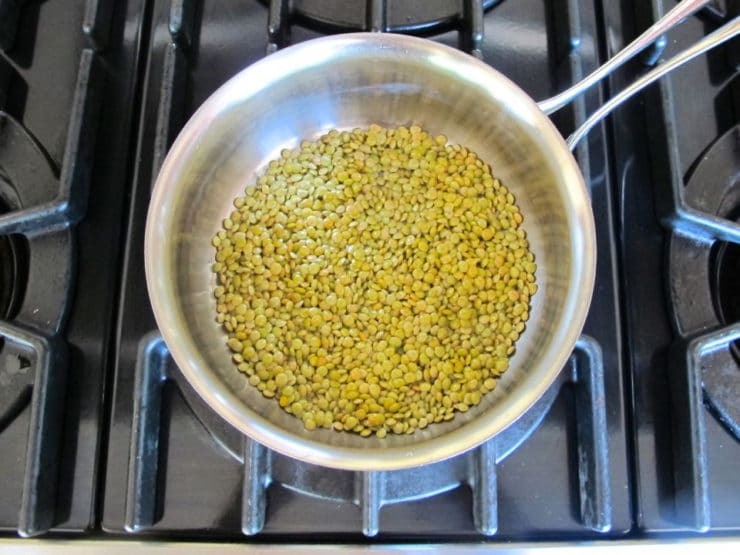 To prepare dried lentils: In a medium saucepan, heat 2 tsp grapeseed oil over medium heat. Add the lentils and toss to coat. Add 1 1/2 cups water and bring to a boil. Cover and simmer until the lentils are tender, about 10-15 minutes. Drain and set aside. If using canned or pre-cooked lentils, do not prepare them, simply reserve them and the minced garlic. To make the taco filling: Heat 1/4 cup grapeseed oil in a sauté pan over medium heat. Add the cumin, turmeric, salt and cinnamon and heat until fragrant. If you're using canned or cooked lentils, go ahead and heat up the minced garlic here along with the spices. 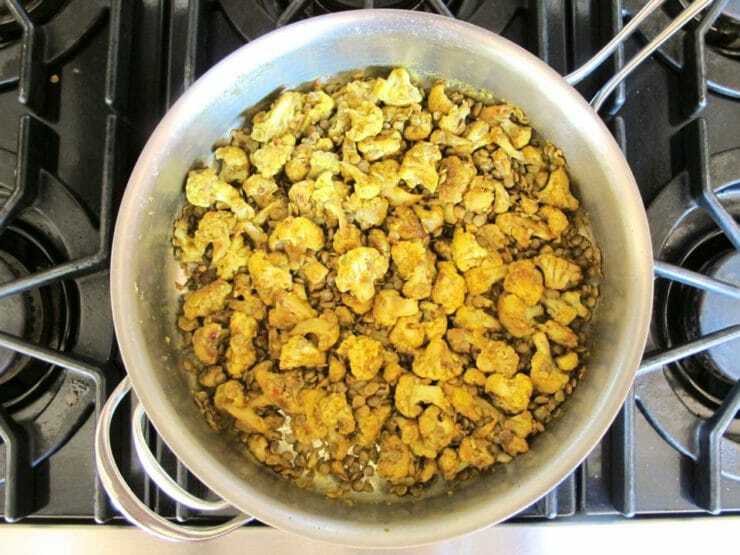 Add the cauliflower and sauté until lightly colored. Add the cooked lentils and 3 tbsp water. Stir to combine, then cover and cook until tender, about 5-10 minutes. Serve the warm vegetable mixture in warm corn tortillas or taco shells and top with your favorite taco toppings (suggestions above). Hi Jonna, I use brown. Enjoy! My wife and I love your blog. We had this dish for dinner tonight. My wife felt like the filing had more of an Indian dish taste than a Mexican flavor. I think if she liked cilantro and fresh jalapeños and Chipotle Cholula sauce that might have pulled it off. We added sautéed porrabellos as a topping with vegan “cheese” mixed greens and chopped tomatoes. She wants the filling as an Indian side veggie dish again. I only used 1.25 lbs of cauliflower but still she wanted a higher proportion of lentils to cauliflower. 2-2.25 lbs of the white cruciferous veggie seemed excessive. Sautéing the dried lentils in a little oil with garlic before boiling was a master stroke that I can use again in some other recipes. Thank you so much for your easy to follow directions and you artistry please keep up the good work! Glad you enjoyed it Sid! I think I will revisit this and possibly up the amount of lentils based on the comments here. Enjoyed the cauliflower lentil tacos. The cinnamon flavor was a new twist. We added plenty of avocado on top. Thanks! These are delicious. Being Mexican, I can tell you that anything inside a folded tortilla is a Taco. For vegeterians, I highly recommend Grilled or Pan-Fried Portabello Mushroom Tacos. I remove the stem, slice them thick, spray with oil, add a little kosher salt, put them on a hot cast-iron grill on medium heat, leave them untouched for 5 minutes, turn them over and cook for another 5 minutes….add them to the folded warm tortilla and add salsa, avocado and/or whatever you like. Taste just like Carne Asada!!! …. I never warm tortillas in a microwave! It is not Kosher! 😉 Always stove-top. I use a griddle or skillet. Is the 10-15 minutes for cooking the lentils a typo? Mine took about an hour. 🙂 Good meal. I think if I made it again I’d double the lentils to 2/3 cup and half the cauliflower (one head instead of two), to give a more “meaty” taste and texture. Hi JMK, most lentil varieties will cook in 10-20 minutes. 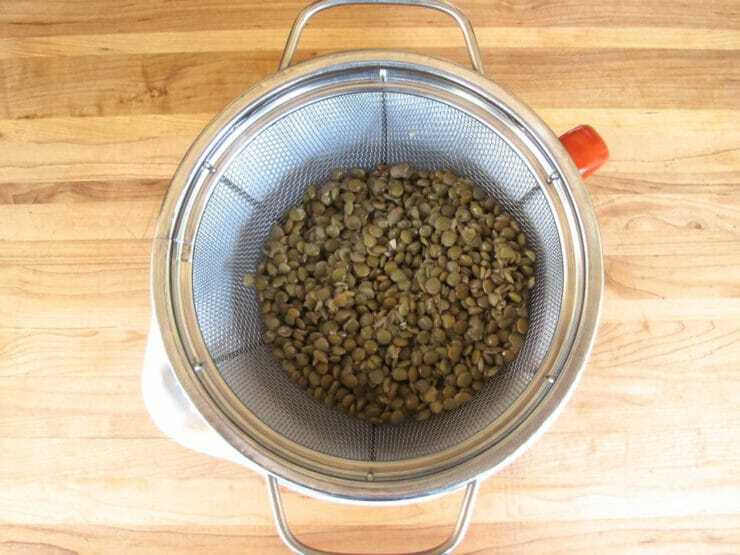 It is possible that you got hold of an older batch of dried beans, those can sometimes take longer to become tender. 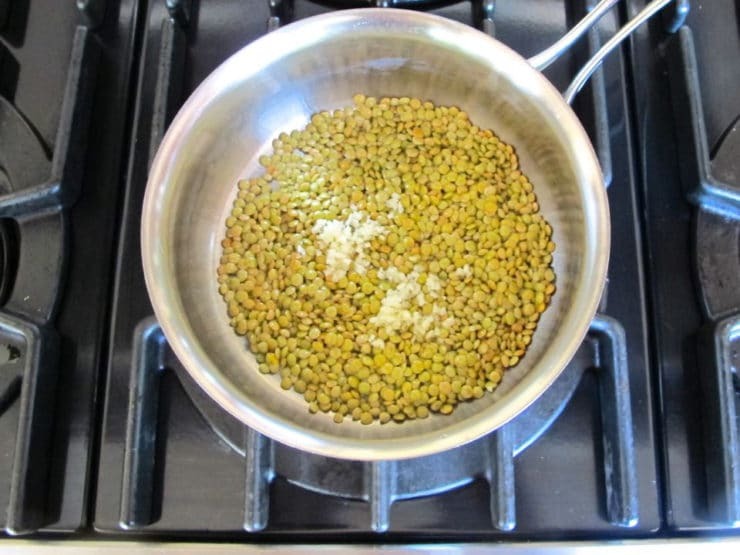 Not a bad idea on doubling the lentils, it really depends on the texture you’re looking for. More lentils would make it “meatier” as you say. Glad you liked the tacos! Califlower ok no lentils for me please! Yummy taco night! Why grapeseed oil? Could you use something else? 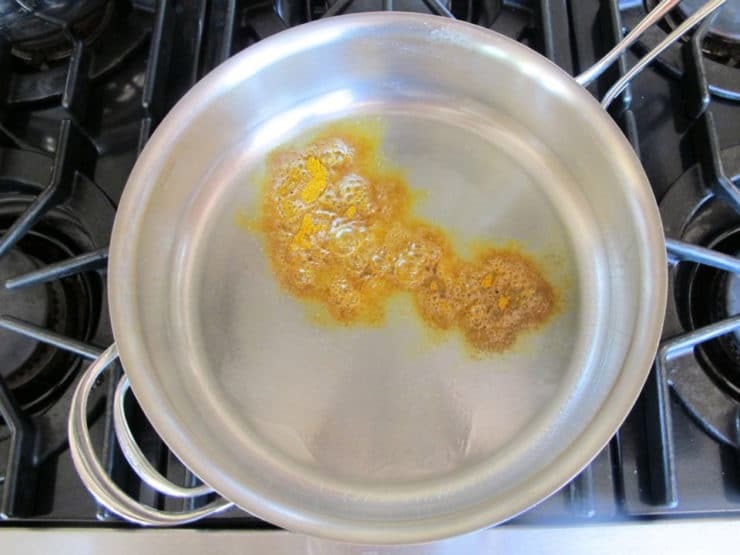 Samantha I like grapeseed oil for sauteeing because of its high smoke point, and it is a very healthy oil, but you can use any vegetable-based oil you prefer including olive oil– just don’t raise the high over medium as you saute. Chickpeas baked with taco seasoning! Thank you! We have been trying to go more vegan Kelly Wilson fault!) and that looks wonderful! Fish tacos are my favorite, but these look great! These are neat :0). I never thought of making cauliflower part of a taco filling, but it makes sense! 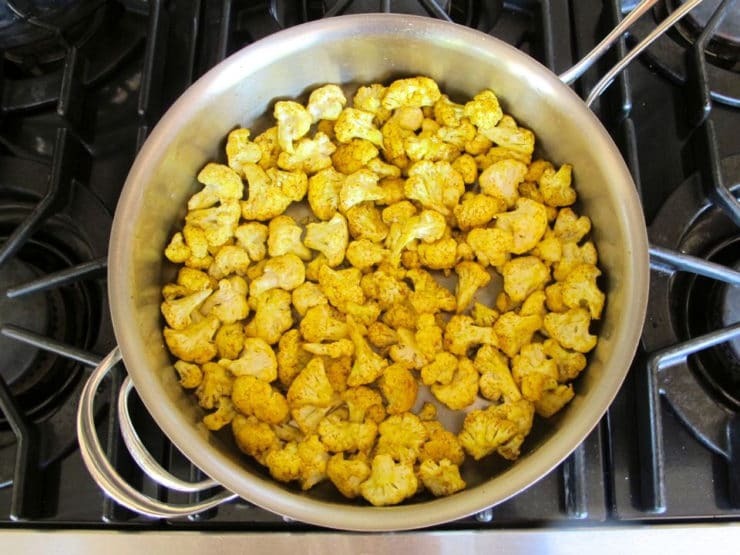 I love how cauliflower is such a versatile vegetable & love trying it in new ways! Thanks for this recipe; I know I’ll enjoy these :0)! They are so good Abbi! Enjoy!